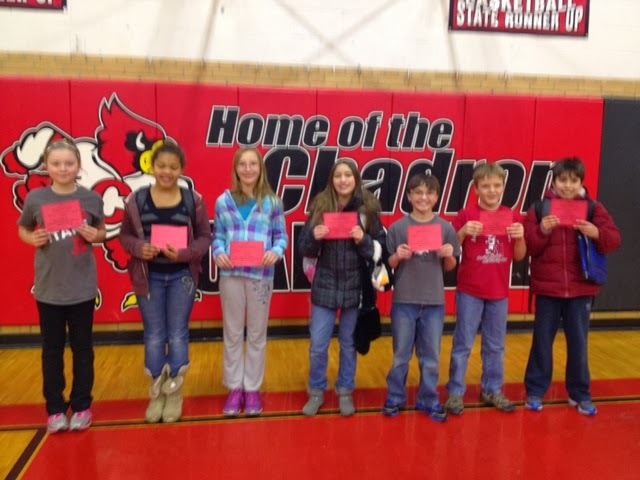 Friday, December 20th was the last day of the first semester at Chadron Public Schools. 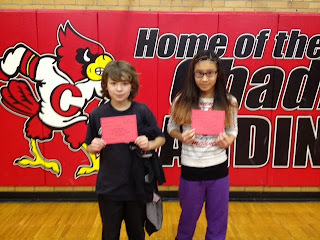 Like usual, we handed out Perfect Attendance and Cardinal Effort Awards at our end of the quarter assembly. Below are the photos of the students who earned these awards. Congratulations to these students and thank you to all of our students for an outstanding first semester! On December 19th, students who participate in band and choir performed their winter concert to a packed house of supportive family and friends. The students, who were directed by Mr. Rischling and Mrs. Dickerson, did an outstanding job! Congratulations to all of the students that performed! At the last Board of Education meeting, the school board granted permission for Chadron Middle School to move forward with its plan to move the playground from its current location on the east side of the building to the west side of the building. The decision to move the playground was born out of the conversations that took place in a series of meetings that Dr. Winchester, Superintendent of Chadron Public Schools, dubbed "The Dream Team". The team was challenged to dream about what they would like the future of Chadron Public Schools to be and focused primarily on building and grounds improvements. As the team worked out their ideas, it became evident that the movement of the CMS playground did not have to wait, and it could be done as soon as enough funds were raised. There are many advantages to moving the playground to the west side of the building. Some of these advantages include: larger play area, grass and trees, and a better use of existing space (East side will become parking). However, the biggest advantage is that middle school students will be separated from the heavy traffic that flows next to the current playground area. 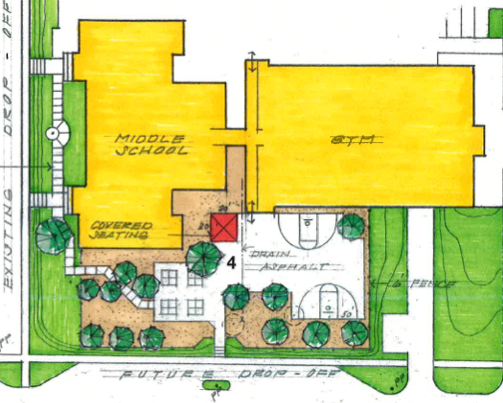 In addition, a new student entrance, which would be located next to the new playground on the west side of the building, would also create a more secure building. We are very excited to begin fundraising and grant writing for this project and with a little luck we hope to see this project come to fruition this summer. However, we have a big job in front of us. The estimated cost for the first phase of the project is $37,000, which includes a key card swipe at the new student entrance, a fence around the new playground, and all of the asphalt. Additional phases to the project will include a sprinkler system and a covered seating area for students. We look forward to working with the community on fundraising for the project and we know that the new location of the playground will be a great benefit our students. The Nebraska State Board of Education today named Matthew Blomstedt of Central City the new Nebraska Commissioner of Education. Blomstedt was selected from a field of four finalists. Blomstedt currently is executive director of the Nebraska Educational Service Unit Coordinating Council. He received a Ph.D. in Educational Leadership and Higher Education from the University of Nebraska – Lincoln; a Master of Community and Regional Planning from UN-L; and, a Bachelor of Arts in Political Science from UN-L. The State Board of Education voted unanimously today for Blomstedt. The four finalists were interviewed Wednesday by the State Board of Education and also met with Nebraska Department of Education staff, legislative staff and representatives of Nebraska’s education partners and policy makers. Several State Board of Education members noted Blomstedt’s experience with members of the education community statewide and, specifically, his experience working with rural Nebraska schools and developing statewide education and finance policy. State Board President Pat Timm said the Board’s goal is to work in partnership with Blomstedt to ensure all students learn at high levels and the achievement gap among groups of students is narrowed. The Board’s focus will include the development of a new state accountability system focused on continuous improvement. The overarching goal, Timm said, is to ensure all Nebraska students graduate college and career ready. A national search was conducted after former Commissioner of Education Roger Breed announced his retirement in July. For more information about Blomstedt, visit http://www.education.ne.gov/. The results of the Caring for Sharing Food Drive class competition are in and it looks like the 8th grade pulled off the win by collecting 634 non-perishable food items. The 6th grade was a close second with 605, followed by the 5th grade with 446 and the 7th grade with 283. The grand total of non-perishable food items that were collected by Chadron Middle School students was 1968 cans! Thank you to all of the students, parents, and partners who donated money and food to this great cause! In keeping with tradition, the winning class has earned the opportunity to compete against the faculty in a series of games on December 20th, the last day of school before break. This year, instead of a basketball game, the 8th grade has decided that they will compete against the teachers in a "Nothing but Net" Pentathlon competition. Events will include: Volleyball, Badminton, Ping Pong, Deck Tennis, and Eclipse Ball. We will also award students with our end of the quarter Cardinal Effort and Perfect Attendance Awards. We will run a special schedule on Friday, December 20th so that there is time to play these games. Students will be dismissed to the gym at 12:30 for the "Nothing but Net" events and we will dismiss students for Winter Break at 1:30. Parents are welcomed to attend the event, which promises to be a lot fun for everyone. Please note that there has been a change on the district calendar. We will have a full day of school on January 17th, 2014. 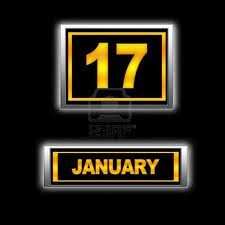 The 12:00 dismissal that was scheduled for the 17th will now be on January 24th. The change was made to accommodate the Chadron Invitational Wrestling Tournament, which will be held on January 24th & 25th. 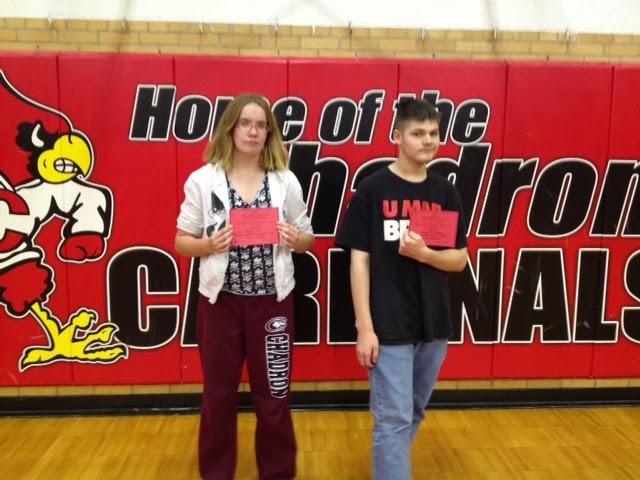 CMS Wrestling @ Torrington - 11:00 a.m.
2nd quarter grades due by 4:00 p.m.
End of quarter awards & Caring for Sharing students v. faculty competition - 12:40 @ CMS Gym. 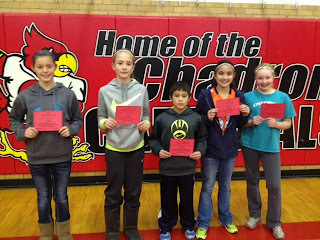 Chadron Middle School students are collecting non-perishable food items for our annual Caring for Sharing Food Drive. The food drive will run from November 18th-December 4th. Students should bring the food that they collect to school and turn it into the classroom that serves as their grade level's collection center (5th grade: Mrs. Merkel's room, 6th grade: Mr. Fernandez's room, 7th grade: Miss Dobry's room, and 8th grade: Mrs. Waugh's room). To make thing exciting, the students are competing in a class competition to see which grade can collect the most food. Traditionally, the class that collects the most food wins the opportunity to play the CMS faculty in a basketball game on the last day of the semester. We always have a lot of fun! 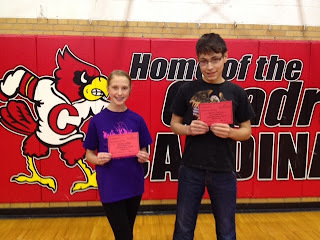 Last year, the 8th grade class class won the competition by collecting 1416 non-perishable food items. 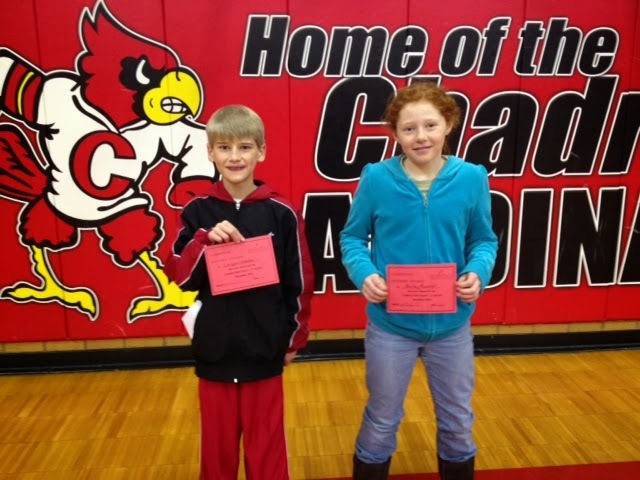 Overall, CMS students collected 3367 non-perishable food items, which was donated to a local food bank. Thank you for your support in the very worthy cause. DeMoine Adams, former Husker defensive end and current motivational speaker, spoke to 7th and 8th grade students on Tuesday, November 19th about how to score in life. Adams outlined five things that everyone needs to do score in life. First, Adams told students to identify their touchdown in life. Whether it is getting good grades, making a team, or being a good friend, identifying your goal is the first step. 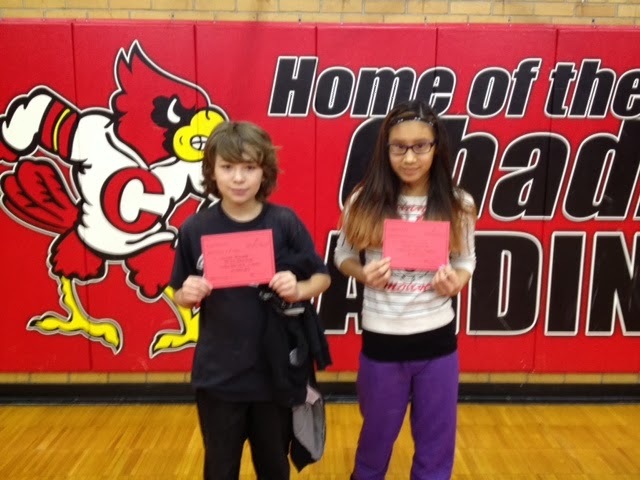 Second, he encouraged students to be their best self everyday by eating right, getting enough rest, and keeping up with school work. Third, he told students to learn how to follow the RIGHT directions. He told students to listen to the people that care about them: their parents, teachers, principal and counselor, because they will lead them in the right direction. Fourth, he encouraged students to surround themselves with winners. Adams, displayed his weightlifter of the year trophy that he earned at UNL and explained that even though he was not the biggest guy on the team, he surrounded himself with winners who helped him achieve his goal. Finally, he told students to never give up. He explained that the game of life can be hard and there will be penalties along the way, but there is never an excuse to give up. Demonie did an excellent job of using the game of football to illustrate a complex concept to students in an engaging and fun way. Chadron Middle School would like to thank DeMonie for coming out to Chadron to inspire our students to score in the game of life! 11/19: DeMonie Adams, former Husker defensive end and current motivational speaker, will talk to 7th and 8th grade students about setting goals to achieve success in the future. 11/18-12/04: Caring for Sharing Food Drive at CMS. Students are welcomed to bring in non-perishable food items to school. 11/21: Girls Basketball 7th grade @ Scottsbluff and 8th grade @ home. 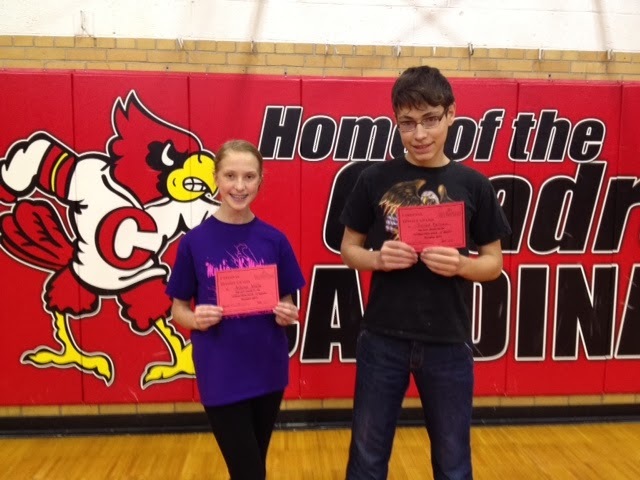 Both games start at 4 p.m.
11/23: CMS Wrestling @ Alliance Invite 8 a.m.
11/26: HS One Act Play - 5th/6th grade will attend at 1 p.m. and 7th/8th grade will attend at 2:45 p.m.
Seventeen 8th grade students in Mrs. Waugh's 8th grade English class have been accepted to have their work published in an anthology by poeticpower.com. 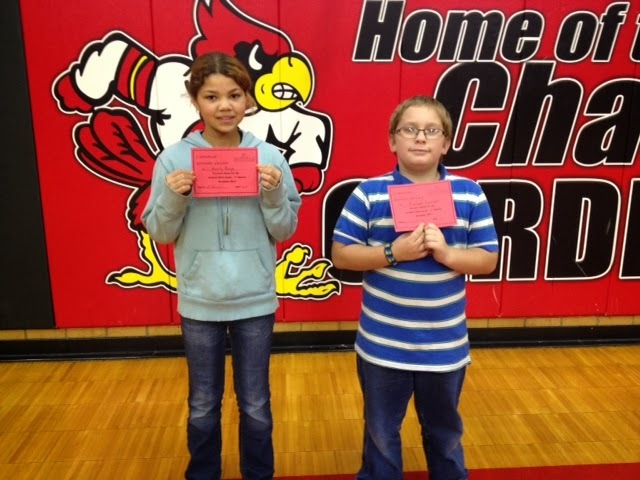 Congratulation to: Coy B., Mia B., Zach C., Jeff, C. Kat D., Jared, F., Ozzy F., Teresa G., Hunter H., Hannah K., MiaKayla K., Cody, M., Joe M., Mumbi M., Brayden R., Brooklyn S., and Jodi W.